Homily for the Funeral Mass of Rev. Patrick Burke. We gather this afternoon with heavy hearts as we pray for and entrust Fr. Patrick Burke to the Lord. We gather in the same church where he was baptised, where he celebrated his First Confession, where he received First Holy Communion, and where he was Confirmed. This is the church where Patrick was ordained to the Priesthood and where he celebrated his First Mass of Thanksgiving. We gather in this holy place, which was Patrick’s spiritual home. In this holy place, then, we give thanks to God for the man and the priest that we have known and with whom we have worked and prayed over the years. His sudden and untimely death at the age of 38 leaves a huge void in all of our lives. His short life was framed by two Papal visits. He was born just a few weeks after St. John Paul II visited Knock in 1979. He was called home by the Lord just weeks before Pope Francis would come and pray at the Shrine. We lay Patrick to rest on this Feast of the Apostles Peter and Paul. The celebration of those “twin” apostles on one day is very significant. It reveals so much about priesthood in general and about Fr. Patrick in particular. In the bible one tradition seems responsible for stability and continuity in the Church, whereas the other tradition is concerned for expansion, enrichment and new pastures. One tradition secured the survival of the early Church and its continuity over history, the other made that survival worthwhile by giving new life through different cultures and peoples. Peter symbolised the first, Paul symbolised the second. Peter was there at key moments confessing Jesus as the Messiah, Son of God and also taking initiatives. As a priest, Fr. Patrick has been there at crucial moments in the lives of his people, welcoming new members into God’s family, feeding them with the body and blood of Christ, instructing them with Christ’s teaching, sustaining them in their marriages and their struggles. He was there with them as they coped with illness and bereavement, with worry and trauma, lending a supportive shoulder and a listening ear. On the other hand so much of the priesthood, which Fr. Patrick lived, had the quality of St. Paul. Through his various gifts, his interests in history, in the Irish language and Irish culture, his contribution to the brotherhood of priests in organising cycle trips on the Greenway, his interest in Galway football, and in so many other areas, his contribution was immeasurable. As a member of the Diocesan Vocations Team he tirelessly presented priesthood to the young. Patrick opened up new possibilities for those to whom he ministered and in this way attracted them to the message of Jesus Christ. This he did with great gentleness and sincerity, making allowances for human frailty and encouraging them to take up the broken pieces of life and put them together in a new way. Coming from his farming background, Patrick recognised that the important thing was to sow the seed and allow the Lord to provide the harvest in His own time. The second reading is something with which Patrick could identify in a special way and those of us who knew him and worked with him realised that it is a reading which provides a privileged insight into Patrick’s own view of Priesthood and generous living of the priestly ministry. The phrases come simultaneously “fought the good fight, finished the race, kept the faith” all conveying this forward and fearless thrust of the courageous race to the end. In his priesthood, Patrick was entrusted with building God’s kingdom, where the life of faith is given tangible expression. He challenged us to live up to our baptismal promises. Priesthood, lived generously is a powerful witness to Jesus Christ. This is especially true in the case of Patrick Burke, one who covered so much ground, at home in any company. He enjoyed and encouraged younger people in their search, supported the elderly in their ageing and fragility, always, however, with a deep sense of acceptance and respect. It came as no surprise, then, over recent days to hear so many people speak of Patrick in terms of friendship. Their hearts were broken, and they fought back tears as they spoke of what he meant to them. I was reminded of that line from the Book of Ecclesiasticus in the Old Testament which says, “A loyal friend is a powerful defence: whoever finds one has indeed found a treasure. A loyal friend is something beyond price, there is no measuring his worth.” A treasure beyond price Patrick certainly was. In today’s gospel Jesus presented Peter as the firm foundation for the Church, providing stability, reassurance and authenticity. At his ordination Patrick was given this responsibility of providing the people of God with this kind of order, stability and authenticity in proclaiming Christ’s gospel. Availability, generosity, humility and a willingness to put his shoulder to the wheel wherever the work of the Lord required it, were the hallmarks of Patrick’s priesthood. In this, this young priest was a role model for all of us. In his ministry the apostle Paul was involved in so many issues in the world of his day. However, at the centre of these was his relationship with Jesus Christ. This gave direction, hope and meaning to his ministry. 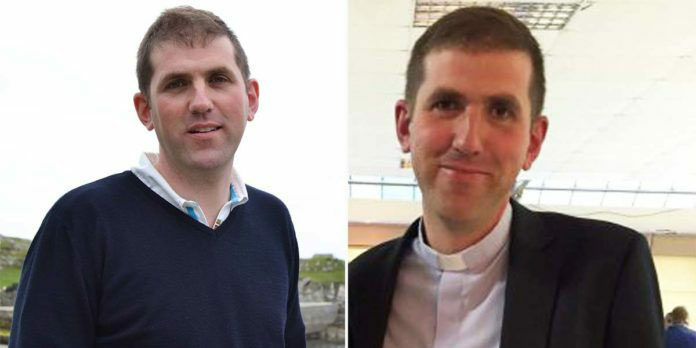 Similarly, Patrick, as a young priest, had been very busy and enjoyed his involvement with pastoral initiatives. These were always brought into his relationship with Jesus Christ. Significantly, the last item which his brother, T.J. found on Patrick’s printer was today’s 1st reading from Paul’s letter to the Philippians in which the Apostle recognises the contribution which various items have made to his life but goes on to state that what is really important is answering the call of Jesus Christ and entering into a relationship with Him. This is something that Patrick did in a very special way in his celebration of the Eucharist where he brought the wounds and hurts of the human condition to the Lord. As we reflect on and give thanks to God for the generous priestly ministry of Patrick we realise how he incorporated into his own ministry so much of the apostles Peter and Paul whose Feast-day we celebrate today. We will always be indebted to Patrick’s family where the seeds of his priestly vocation were first sown and to whose values he gave powerful expression in a life of humble service. May his life inspire all of us as we struggle to relate to Jesus Christ in a complex world. Ar dheis Dé go raith a anam uasal Gaelach agus leaba aige i measc na naoimh.